'The RM EP is to pop music what lion were to the Romans. 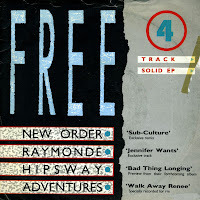 A veritable signal post in the history of popular music, it is graced by the noble presence of New Order - already well establish in the halls of the gods. Hipsway, up and vying for a throne therin, the Adventures - another young and strong contender - and, last but not least, Raymonde, tipped by many as one of the most exciting newcomers this year. This is the RM EP - play it morning, noon and night'. Well, there you have it. The UK magazine Record Mirror gave out this 7" single with their magazine sometime in 1986 and a decade later a record shop was trying to sell it. According to the price sticker, they weren't very successful. The price started at 1 pound and fell to 20p by the time I bought it. 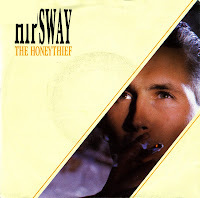 Hipsway were formed in Glasgow in 1984 by ex-Altered Images guitarist Johnny McElhone on bass, and featuring Grahame Skinner (vocals), Pim Jones (guitar) and Harry Travers (drums). They were soon signed up by Mercury Records and released their self-titled debut album in 1985. Their debut single 'The honeythief' made number 17 in the UK singles chart, but stalled at number 33 in the Netherlands. The band split up in 1989, with McElhone leaving to found Texas. I don't think I remembered the song when I bought it, but I did know I liked the song. Many years later, the track has disappeared from my memory alltogether. It was nice to hear it again when I played it recently.